Custom wheels are built to order, so it's important to get the measurements right. In this video, we use a FORGELINE custom racing wheel to demonstrate the techniques used to measure wheel width, backspace, and frontspace, as well as offset. These dimensions are not hard to measure and calculate, and this video will help you get them right. It’s been said many times that the wheels can make the look of a car, and while Forgeline wheels are show quality, they are built strong enough for the stresses of racing. In this special episode of V8TV, we take an inside look at Forgeline and learn how these custom racing and street wheels are made, all in the USA. From forged aluminum one-piece Monoblock to 3-piece wheels, Forgeline remains on the forefront of design, strength, and race-winning quality. For more information on how to get your set, contact http://www.forgeline.com. New Rocket Attack Wheel Offers New Designs and New Technology From Rocket Racing Wheels! If your custom aluminum wheels have seen better days, there is a possibility that they can be restored to look new again. We took our Vintage Wheel Works V45 wheels that have been on our '62 Ford Galaxie 500 XL since 1999 to Dent Wizard's wheel refurbishing center to have them brought back to as-new condition. The Dent Wizard crew stripped the wheels, blasted and cleaned them, painted the centers, CNC machined the rim, and clear powder coated them to keep 'em looking new. We then added a set of custom white and red lined tires from Diamond Back Classics to give our old Galaxie a look all it's own. We think they look great, what do you think? Wheels and tires can make or break the look of your Muscle Car, and if you order custom wheels in the wrong size, you're stuck with them. In this video, Kelle shows us how to properly measure wheel width, diameter, bolt pattern and size, offset, and backspacing. We also learn about tire sizes to unscramble the mystery of the numbers on the sidewall. Can you believe that 1 in 6 wheel weights fly off cars on the road? Not only does this throw your car into a shake at speed, but the lead weights are accumulating all over the country causing a health hazard. 3M came up with an innovative and safe solution with a new weight system that is good enough for Indy cars. Wheels and tires can make or break a car's looks and performance, and we wanted to choose our wheel and tire combination carefully. We wanted to equip our 1965 Chevelle with wheels that will look good forever, without being too trendy. We also wanted tires that offered great performance without sacrificing ride and comfort. After carefully measuring the Chevelle with a Percy's Wheel Rite tool, we selected a set of Vintage Wheel Works V40 straight-spoke wheels measuring 17x8" with 4 3/4" of backspace. These wheels are practically made for the car, with their crisp, timeless, and aggressive styling. For tires, we chose a set of BF Goodrich g-Force Super Sport A/S tires in 245/45R17 rear and 225/45R17X/L front sizes. The g-Force Super Sports offer aggressive looks, great all-season traction, and construction stiff enough to handle the autocross without sacrificing comfort. 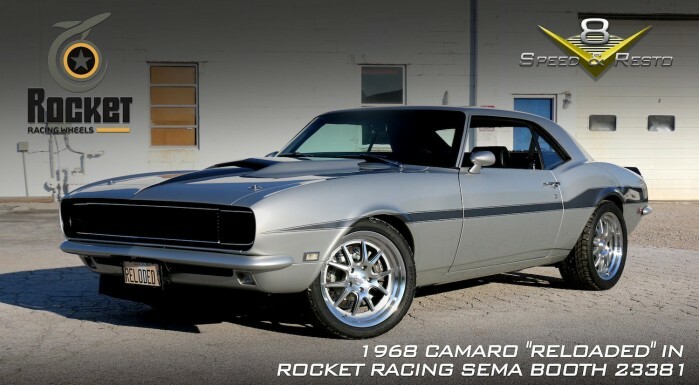 1968 Camaro Countdown to SEMA Show 2011 V8TV Video: Rocket Racing Wheels & Toyo Redline Tires! Wheels & tires make up a huge part of how a car looks and performs, and we're running some cool ones on this Camaro! Check out the Rocket Racing Booster wheels done in polished lip / gray face for a nostalgic look, and the killer redline Toyo Proxes T1 Sport tires! The tires were redlined by Diamond Back Classics, and the process vulcanizes the red stripe to the side wall, meaning it won't peel off or rub like paint. It's part of the tire. Cool stuff! Rocket Racing Wheels are bringing back great-looking vintage styles and adding modern touches to their wheels. Here, David Coker tells us about the history, styles, finishes, and sizes available from Rocket Racing Wheels. We ran a set of gray faced Rocket Booster wheels on our '68 Camaro "Reloaded", and people can't seem to get enough of them! We're running some Toyo Proxes T1 Sport tires on our '68 Camaro "Reloaded" car we just finished, and while we were at SEMA 2011, we got the inside scoop on the whole line of Toyo UHP tires. The right wheels are often hard to pick for a car, especially when you consider the proper sizing, fitment, strength and safety aspects. We are running a set of Weld Racing S71 wheels on our Olds "S71", and not just because they share the same name. Here, we chat with Kyle Fickler about all these aspects and how Weld Racing approaches each wheel as a custom part. HRE wheels is a premium US made, high-performance wheel manufacturer that wowed the crowd at SEMA 2012 with four new wheel designs, including a new carbon fiber wheel, and a signature line designed in conjunction with Ringbrothers. We were there for the official unveiling!